Joining Catholic schools across the nation, the Mater Dei community celebrated Catholic Schools Week January 28 – February 3. 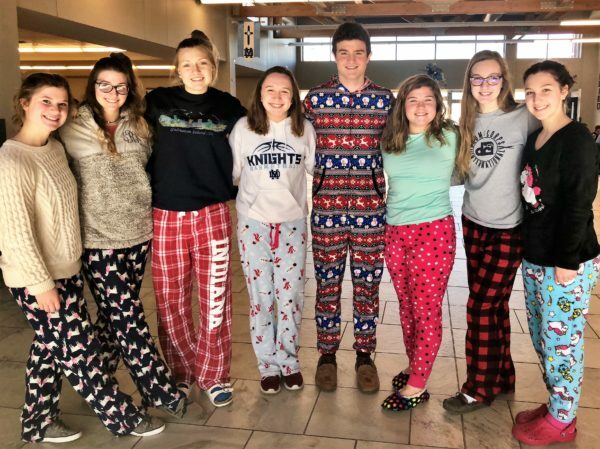 The theme for this year’s celebration was “Catholic Schools: Learn. Serve. Lead. 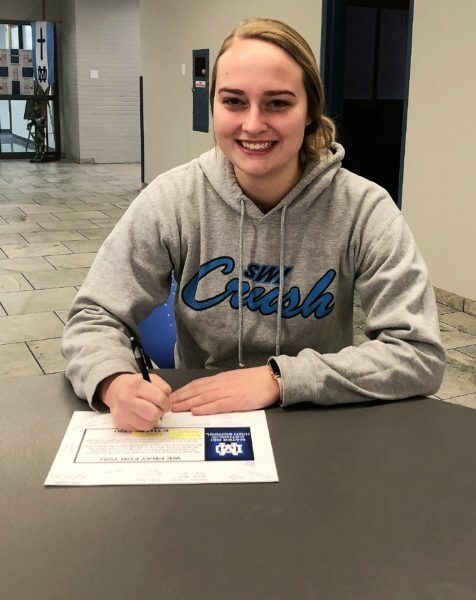 Succeed.” The week of fun-filled events included days of appreciation for our students, our faith leaders, and our administrators, faculty, and staff, as well as days to share our faith in our community and in our nation. We were blessed with a spirit-filled week! 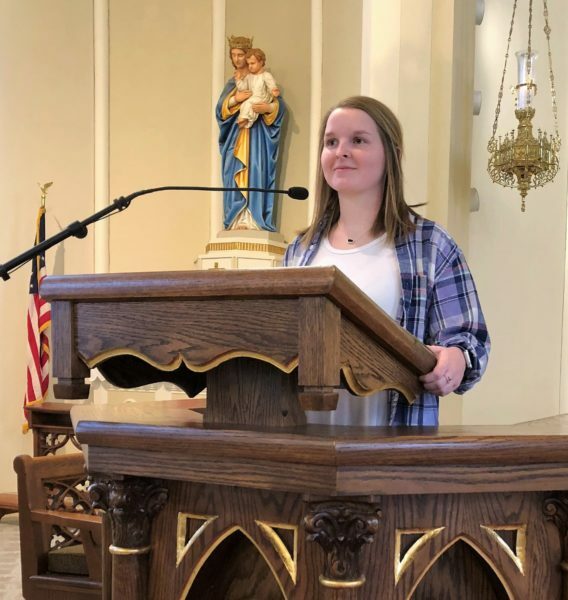 To begin the celebration of Catholic Schools Week, Mater Dei students offered words of gratitude to the parishioners in the local Catholic churches for their generous support. Senior Lauren Fields is pictured thanking the members of St. Dominic Catholic Church. 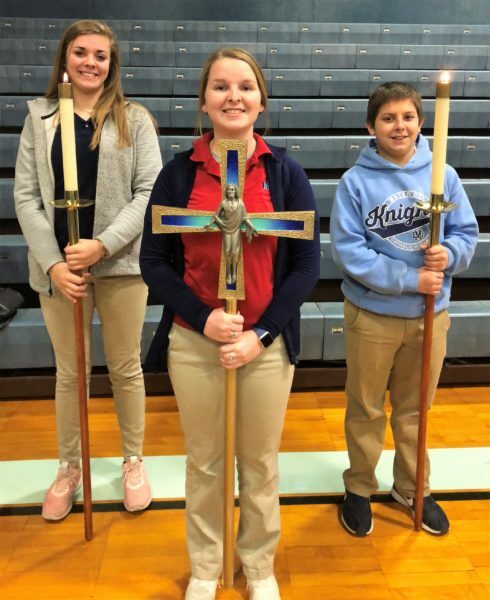 (from left) Emma Gebke, Lauren Fields, and Kaleb Kues are pictured prior to our Catholic School Week Mass, for which Fr. Patrick Peter of St. Dominic Catholic Church served as the celebrant. 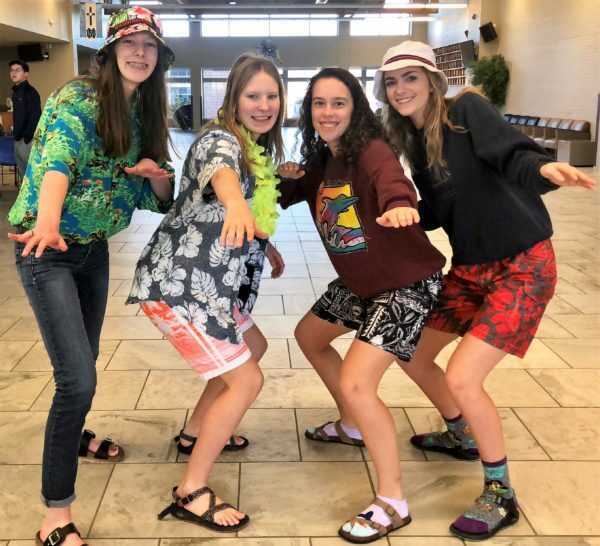 Despite the cold temperatures, (from left) Hannah McSparin, Gretta Stark, Katie Wieseman, and Alyssa Becker enjoyed our Catholic Schools Week Surf’s Up dress theme. 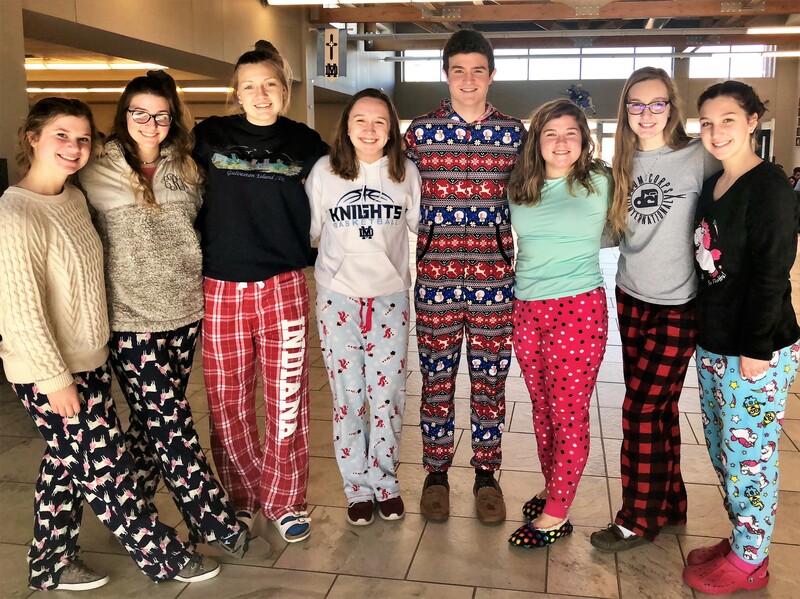 (from left) Caroline Kenow, Emma Rogers, Quinn Cutler, Abby Arentsen, Harrison Mondt, Sophia Mondt, Jordyn Muscarello, and Gracie Loepker enjoyed a day of learning in comfy pajamas during our Catholic Schools Week Wake Up dress theme. 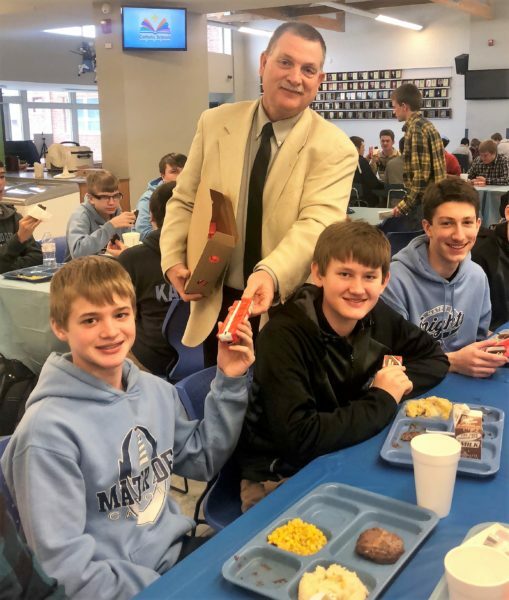 Principal Mr. Dennis Litteken is pictured on Student Appreciation Day delivering ice cream sandwiches to students (from left) Ian Berndsen, Blake Kloeckner, and Carter Ritzheimer during lunch. 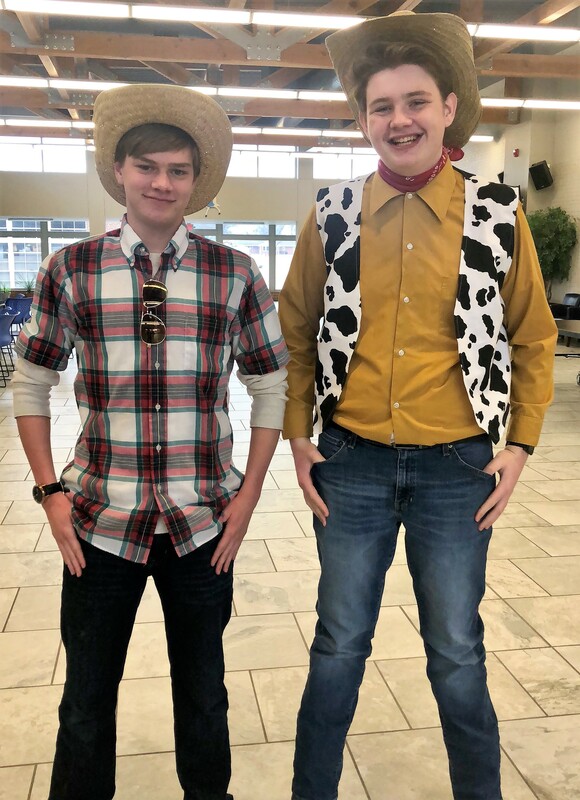 In the morning, students enjoyed popcorn while viewing the movie How to Train Your Dragon on the “big screens” in the main gym. The halls were filled with cowgirls and cowboys, including Alex Detmer (left) and Ben Wilke (right), for our Catholic Schools Week Giddy Up dress theme.